Parenting is hard. If you are a parent, you already know that. If you are not a parent, but you pay attention, you know that. Parenting is relentless and exhausting. How much so? So much, that one of my best metaphors is that it is like raising a velociraptor from Jurassic Park. How kids are like velociraptors comes from the original movie from 1993. 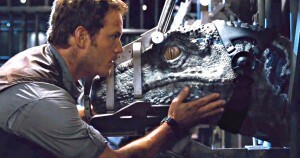 In the beginning of the movie we are introduced to raptors. Dr. Grant describes them as dangerous hunters. 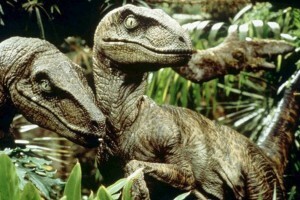 Then later when he visits Jurassic Park he is horrified that they would breed raptors. Then in what is one of my favorite scenes, Muldoon, the Crocodile Dundee-ish (Boom! Even more dated reference than the original Jurassic Park movie! ), game warden describes to the scientists his encounters with the raptors. The raptors are systematically going around the electric fence and charging it. When asked why, Muldoon says that they are testing the fence for weaknesses. They were relentlessly slamming up against an electric fence looking for weaknesses. They did not care that they were getting electrocuted, they were testing the fence and looking to get out. If you do not see the parallels to parenting, then you haven’t been parenting very long or you haven’t been paying very close attention. Kids are relentless like raptors. You put up a fence (a rule or boundary) and they spend their entire day/week/month/year/life testing that boundary for weaknesses. You say to your toddler to not touch the stove/TV/fireplace. They walk over to it slowly, right to the object (metaphorical electric fence) and reach their little hand out. Why? To see if you mean it. To test the fence for weaknesses. Over and over and over again. They are constantly ramming the fence. Some seasons are worse than others. We call these stages Velociraptor Mode. They just are relentlessly testing everything that you say, every rule, boundary, everything. All The Time! You are tempted in these moments to give up. Maybe you start to doubt yourself as a parent. Maybe you begin to tell yourself that you are just too strict. Maybe it would just be easier if you relented and got rid of the fence. I know that it might seem that way but it is very important that you understand this. There is a key difference between your kid and a velociraptor. Your kid, deep down, needs and wants the fence to hold. They need security and consistency. They need to know that you are in charge and you have things under control. Even though everything about the way that they are acting says the opposite, know that they do not want to be in control. They do want the security that you provide for them. I know this to be true, because the most stressed out kids I know are the ones who don’t know where the fence is. It’s not that they have no boundaries (although those kids are pretty stressed out as well), it’s that they don’t know where the fence is or it is constantly moving. Your little raptors need that fence. They need to know that they are safe. This goes for kids in their terrible twos to kids in their sassy seventeens. Do not let the exhaustion of the constant testing and charging discourage you from being a great parent. I understand that this is relentless, often thankless job. But if we don’t lose heart, and let the fence hold, you will discover over time that you have a great kid who respects authority and is growing into an awesome young man or woman. In the mean time, where can we all get some of these? I’m not going to lie to you, I’m tired. It’s a good kind of tired (Worn-out cliche alert). At the end of the day (Another one), it’s hard work being a parent, but it is completely worth it. You get back more than you give (Should I keep going?). But honestly, it is exhausting. The only way that parenting doesn’t wear you out from time to time, is if you aren’t doing it right. You see (does that count as one? ), children are relentless. Rebellion, selfishness, their need for discipline is ongoing. We have 3 girls in our home now, 14, 11 and 1/6. This broad range of ages provides us with a lot of different kinds of challenges. We have one who interacts with teenage boys all day (yikes and yuk), one who has begun the stage where girls begin to create relentless drama (yuk and yikes), and one who poops her pants (just yuk). There is almost (?) always something going on in our house that requires some parenting. A “tone” that you hear from a conversation going on between the two oldest, a baby who can’t/won’t take a nap, chores that just won’t get done even though you have asked more than once (that baby just won’t keep her room clean, no matter what we do), or yesterday’s problem–constipated baby. The question we have to ask is do we have the stomach and the will and the energy to parent. Too often, parents choose the path of least resistance. What brings peace and/or quiet the fastest is rarely what is best for the family in the long run. Ignoring it keeps you in the chair but fixes nothing. Giving in may make them quiet, but it creates what we call “unsustainable systems” (read kids who think they can always get what they want by whining, yelling, fit-throwing, etc.). Yelling in anger certainly gets attention, but at what cost? It’s not always easy, but’s it worth it. Then you can sit down and rest until the next time (read not very long). Did I mention that it’s worth it? Hang in there and go for it (You knew one more was coming, right?). How Do I Keep from Breaking My Daughter? This is an actual question put to me on a golf course recently by a friend and fellow dad of daughter. I don’t know if that is word for word what he said. If it wasn’t “break” it might have been “ruin” or “mess up.” Regardless, it was something like that. I love the question because it really gets at the heart of most guys’ fear about having a daughter. We consider daughters to be significantly more breakable than a boy. Boys are durable and tough, and girls are fragile. Disclaimer: I am not saying that there is such a difference between boys and girls. I’m saying that is how dads feel. Little boys are significantly more fragile than most dads realize. Clarification: Fragile does not connote weakness, at least not in this case. It really is better understood as valuable and precious. All things that are valuable and precious are breakable. That’s how we feel. You can’t judge our feelings (I may or not be crying now). I think in my verbiage (turns out it’s not verbage, but verbiage and connote not connotate. Thanks red squigglies. Even though I’m ignoring you with the word “squigglies”) in that last sentence, anyone can figure out what one of my pieces of advice was–your daughter needs to be disciplined as well. Despite the fact that she is beautiful and sweet, she also has a sinful, selfish heart that needs to be shaped. She needs to be corrected, disciplined and punished, just as you would your son. “Just as you would? That can’t be true. It has to be different.” I can agree with that for the same reasons that I would say that you have to discipline different boys differently. They have different personalities, tendencies, respond to different punishments uniquely, etc. However, despite the differences between children in general and girls and boys specifically, one similarity remains–they need to have their selfish desires and hearts shaped by a loving parent. We risk “breaking” our daughters when we are one to the exclusion of the other. Most guys, at least with girls, tend to dote and not discipline. I certainly am not advocating the other extreme. Balance, no not balance, but the appropriate role at the appropriate time under the appropriate circumstances is what we need to strive for as dads. But that is a blog post for another day. Whoa! A sequel. I know. Doesn’t it remind you of the old days? “Old days? This blog hasn’t even been around a year and a half.” I know, but in that short history was an 11 part series entitled Stuff Christians Need to Stop Saying. That’s right, 11. That was followed by a series that I got disinterested after 1, entitled Stupid Things Christians Fight About #1. Since there was only one, the #1 seems pointless. I guess I could go back, Tron style, and make a sequel after a long gap. Anywho, this is not really going to be a series. It’s really more like what is happening with the Hobbit or back in the day with Back to the Future 2 & 3. There was one idea that ended up needing to be stretched over 2 installments. “Enough with the movie references, get on with it.” If you read any of the links above, you’ll get why I did it. It’s a throwback. We moved to O’Fallon, MO in January 2002. That seems like a very long time ago, almost like 10 years or something. Lauren Loften was 15 months old and big sister Maylee had just turned 4. But then there was Lauren in STL from (15mths – 5 yrs). Maniacal toddler and preschooler. She never learned to walk. She went straight from crawling at 6 months to running about 9 months and never slowed down. She would put her arms in the air and run full speed until she crashed something. She would fall down, shake it off, turn a new direction and repeat the process–indefinitely until it was time to eat (She shared the same meal schedule as Hobbits). So when we moved to St. Louis, we bought a house that had a nice backyard, but no fence. Would you like to guess what our first priority was? That’s right; building a fence. We never let her out in the yard until we built that fence, unless one of us was holding on to her. Her in a yard with no fence was an unbelievably scary prospect. Why did we build that fence? To protect her. We lived one house away from an incredibly busy street and just a few houses down from a pond. We needed to protect her from danger and mostly from herself. We built that fence out of love. You see, there are two kinds of fences–prison fences and backyard fences for toddlers. In a prison fence, you put all the bad things in the fence to keep the bad contained. All the good stuff is outside the fence. That’s why prisoners want to escape, to get from punishment to freedom. A backyard fence is different. We put the swing-set inside the fence. We put all the toys inside the fence. All the good stuff was inside. We built it to protect what we valued and loved from danger and herself. Into what category do the “fences” (discipline, structure, rules) we build for our kids fall? (I actually re-wrote that sentence so it wouldn’t end in a preposition. Scholarly, I know) Ideally, they are backyard fences with a big yard and lots of fun things to do. They are not punishments but protections from danger and themselves. We want them to enjoy life, but inside the protection of the fence. However, our kids often feel they are prison fences. They stand at the edge and scream and fuss, like a prisoner. They are begging for freedom and escape. How do you respond? As we talked about in part 1, the fence needs to hold. They need it to hold. They need stability and security. Do you know what happens when we give in? When we come to them and say dejectedly, “fine, do what you want,” we are agreeing with them that the fence is a prison fence. You are giving them parole from your punishing fence. Now, in their mind, the whole fence, every rule and restriction is that way. That brings chaos for you and them. Parenting is hard. Discipline is hard. Raising and training great kids is hard. Hang in there. Hold strong. It pays off in the long run for everyone. “Cloften, with a title like that, this had better be a good post…no great post…hmm, how about just better than mediocre ramblings with an obscure pop culture reference.” Sorry Reader (intentionally singular), that’s exactly what this is. You ever have one of those days where one of your kids is just relentlessly pounding you? Or they keep doing the same bad thing over and over again or they are consistently nagging/hounding you? (”Can I ______?” “No” “Please” “No” (repeat indefinitely or until all of hair has fallen out)) No, of course not. Only other people’s kids do that. Well, you can still read this, so you can help other parents. I have dubbed this Velociraptor mode. This comes from a great scene in Jurassic Park. (Now listen, I consider myself pretty interweb-savvy, and Utoob savvy. I looked for this clip and couldn’t find it. If you find it, I will insert the link and I will dub you Dork of the Week) In this scene, Robert Muldoon (the creepy/super-cool park ranger guy) is explaining to the scientists how the velociraptors conduct themselves in their electric pen. They systematically go around from one section of the fence to another ramming it full force. They get knocked out, and then another one will do the same to another section. The scientists ask why and he says they are testing it for weaknesses. If you have a child that is over 2, then the analogy is pretty clear and we should just close in prayer. “Dear God, Please help me not put down my velociraptor. Amen.” If it is not apparent, let me help. Your kid is constantly testing the borders and weaknesses of the boundaries and rules that you have. They act like there is no fence there, they don’t care if they are about to get electrocuted (metaphorically of course). They want to know if there is any weakness in the fence. The fence has to hold. If you have put good, healthy boundaries on your kid and they start fighting, you have to hold firm. Kids will do fight, test and rebel. I can tell you that at ages 2, 3, 4, 5, 6, 7, 8, 9, 10, 11, 12 and 13 that they will. I’ll let you know about 14 next year, though I’m pretty sure I have solid idea already. You need to hold strong, and here is why. Kids want and need the fence to hold. They are safe and secure there. The most anxious, angry, fearful kids I know are the one with little or no or variable boundaries. They are never safe and never at peace. There is no structure or boundaries to protect them. I know it’s hard. I know you are tired. I know that it is just easier to let them have cake for dinner, go to sleep in your bed and throw rocks at the house. Trust me, in their heart they need to know that you are protecting them. That’s why the boundaries are there. That’s why they don’t get to play around the stove or run with scissors. Similarly that’s why they need a nap and need to eat some fruit (shout out to my mom there). I promise you that if your fence hold even in the hard times, both you and your kids will be happier and safer in the long-term. But watch out, Newman might be deactivating the security system during a huge rainstorm and be trying to steal some dinosaur DNA. If that happens, you are in trouble no matter what. Wellpst, I’m hanging out in my office away from office (Chick-Fil-A) on Monday morning, and there is a family with a little girl, probably around 3. She was uber-cute, but let’s say she was active(? ), no that’s not it, loud(? ), nope that’s not it, hmmm, belligerent, defiant, uh you get the point. 1) I judge no one or their parenting, I mean no one based on an incident in public. We’ve all been there. 2) I also will not judge based on what your 2 or 3 year old does. We’ve all been there too. If you haven’t yet, please don’t ever look at a 2 yr old acting like Taz and say to someone, “My child will never…” Seriously, it just keeps you from eating one more set of words. 3) There is no verse to go along with this post. Maybe there is a verse in Proverbs I could use to justify some of this. More than anything these are just some thoughts I have on parenting. Since I’m the only one who has the password to post stuff on here, I write the stuff. Anywho, this little girl, again that is very cute, is not maintaing good public decorum. Her mom then says, “You are in big trouble, when we get home.” Not good. Maybe for a 10 year old. In an hour, that kid is not going to remember at all the infamous “flinging of the chicken nuggets” or “screaming of the banshee.” She will have moved on. There will be no connection in her mind. Punish her then or just don’t. If you feel like you can’t, because of where you are, then forget it. The punishment at home will make you feel better, relieve some tension and anger (not good motivators for discipline FYI), but it will not change behavior. Simyalarly, if the kid is acting out in public, you need to take some action. You do not want to get into a situation where your child knows that they have the upper hand in public. They will destroy you with that knowledge. I know, I know, not your precious angel, but, you know, other kids do that. Kids that age are trying to determine what the boundaries are, and in their way are trying to figure out who’s in charge. They want it to be them. (They are no different than any of us in that way.) Kids need to know that you are in charge. They need your help. They need appropriate boundaries. Help them by communicating to them in a healthy and firm way that they will hear and get the message. Let’s forget for a second the disrespect of a kid interrupting to tell you that you shouldn’t speak when she speaks. (After you forget, remember and don’t let your kids do that.) Why is this kid saying that? Why does a kid lash out like that? I wonder if she feels like she is ever getting the full attention of her parents. Many kids that scream, literally or figuratively, “notice me. notice me!” don’t ever feel like they get your full attention. Ask yourself, does my kid ever get my whole attention, my face, my eyes, my heart? If she can’t get your attention in healthy ways, expect that your kid will try in unhealthy ways. “Sweetie, I know you are talking. Don’t interrupt. I will talk to you in just a second.” Then, in just a second, do, in fact, give your undivided attention. There is kind of a vicious cycle going here. The kid has no boundaries, so she acts wild. The parent doesn’t do anything about it and ignores it. Parents start tuning out the kid. Now the kid can’t get parents’ attention no matter what she does, and needs to lash out in incredible ways just in the hope of getting some attention. Sometimes even then, they can’t. If they do, it’s bad. Break the cycle. Give your kids boundaries. Give them attention. Give them what they need without giving in.